One big key to being a consistent attacker is learning how to track the set before taking your swing. Here, Deborah Newkirk of Coach ’Em Up shares her track-and-smack method of teaching this skill. 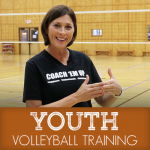 This content was taken directly from one of our online courses, the Youth Volleyball Training Series, presented by Deborah Newkirk. Check it out!